Aloha my charming little eggs! Now, today I have a very long overdue review post for you. The one thing I’m undoubtedly complimented on the most at the moment is my hair colour, having finally achieved the silver/grey blonde hair that I’ve been chasing for months. It’s certainly not to everyone’s taste – a lot of people look at me with a kind of sympathy as if I’ve obviously had some sort of hair dying mishap/incredibly shocking experience that has sent me grey at the age of 23 – but I’m really pleased with it and a few other people have asked me how I’ve finally managed to get it. Before discovering Mellor and Russel’s Simply Bright hair dye in silver I’d tried numerous toners. You can read my La Riche White Toner review and my Bleach London White Toner review by clicking those there links, and I also tried out the La Riche Silver Toner, which was definitely the best of the 3 for what I was trying to achieve. However none of these were quite colouring all of my hair; there were still some stubborn yellow bits that were just refusing just tone. 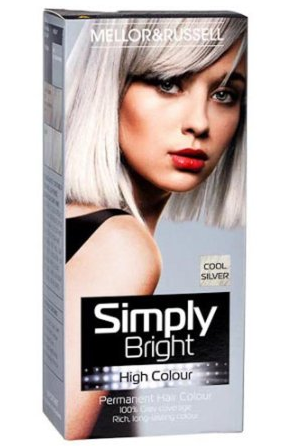 The reason that Simply Bright is different is because it’s actually a permanent hair colour as opposed to a toner. This obviously means it’s a little more riskaaaay as it contains peroxide, but the fact is it gets the job done! This finally provided me with the all-over colouring I’d been looking for, and I don’t really think my hair feels any more damaged after using it. As I dye my extensions too I need to use two boxes, and I tend to do this around every three weeks. On top of this I also use all of my products for silver hair (which you can read about here if you so wish) to keep things funky fresh. Oh, and have I casually forgot to mention where you can buy this hair dye and for how much? Sure, you can try to track it down online on sites such as eBay or Amazon… or you could head to your local POUNDLAND. Yes, you heard right. They stock this in Poundland. Every time I go in I panic buy another 5 in case they suddenly stop stocking it. It is honestly my biggest nightmare in life. Have any of you tried this dye? 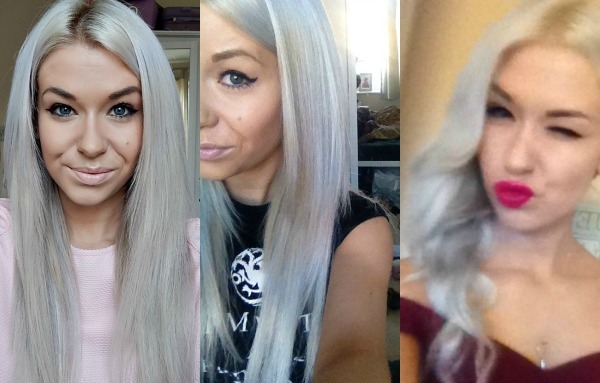 What are your tips for silver hair? Regular readers of this crap our great blog will know that I’ve been on a mission to get my bleached hair silver/grey for quite a few months now. 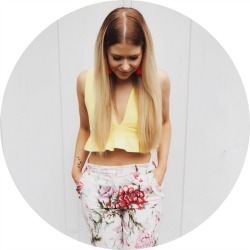 While toners and dyes are obviously the main way to achieve this, maintaining the colour is just as important as getting it in the first place. 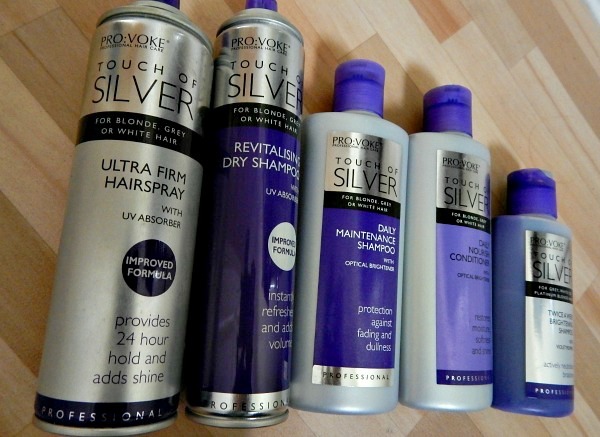 A lot of blondes swear by silver shampoos – which are usually actually lilac or purple in colour – to eliminate the brassy yellow tones from their hair. This is because yellow and purple are opposite each other on the colour wheel, meaning that when put together they neutralise one another. So to get rid of yellow tones, you need to add some purple. 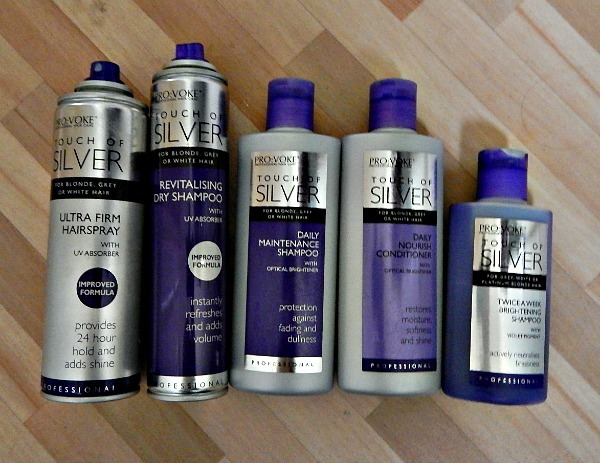 I’ve tried a fair few brands of silver shampoo in my time, ranging from the super-cheap Poundland favourite Bristow’s to the more mid-range Osmo from Sally’s. I can now safely say with confidence though that my favourite is the Touch of Silver range from Pro:voke. I got all of these from my local Bodycare for only a couple of quid each, so this whole range only cost around a tenner. Can I get a whoop whoop?! No, please don’t whoop whoop. Anyway, according to the Touch of Silver website there’s also an Intensive Treatment Conditioner and a Dry Conditioner so I’ll obviously be keeping my beady eyes open for those on my next trip. This has all the perks of a normal hairspray – ie stops us looking like cavewomen when we get caught in a bracing wind – but also apparently has UV Absorber to help protect the colour of silver hair. It also allegedly has Silk Proteins (whatever they are). Everybody knows I hate washing my hair so this is of course a god-send. Again this has UV Absorber to help minimise colour fade, and I also notice that after using this my colour looks a bit more even – so I suspect it’s coloured a little bit differently to your usual dry shampoos too. This is to be used as the regular daily (or every other day, depending on how often you wash your hair) shampoo. To add to the collection of pseudo-scientific ingredients that shampoos are always packed with, this also has Optical Brightener (ooh!) to ‘intensify the reflected light’ which basically just means it makes your hair dead shiny. This is actually really difficult to do with blonde hair so, mocking aside, the fact that it delivers on this promise is actually really good. To be used after the daily shampoo, this conditioner has all of the other junk but then also makes hair nice and soft. This is of course essential for us ladies who have abused the crap out of our hair to stop us looking like scarecrows. And now we reach my favourite of the products. This shampoo is a much more intense violet than the daily one, hence why it’s only supposed to be used once or twice a week. After leaving this one on for a couple of minutes, it works its magic and actually tones your hair, banishing the yellow tones. It’s important to remember that the amount of pigment used in this range – especially in the Twice A Week shampoo – actually makes it effectively a semi-permanent dye. If you’re not used to using silver shampoos then I would recommend treading carefully the first couple of times and not leaving them on your hair for longer than it advises on the bottles, or else you might end up with lilac tones in your hair (which I don’t personally mind, but hey ho I just walk on the wild side of life). The website also advises not to use these products on your hair immediately after it’s been bleached, as the porousness of the freshly coloured hair could lead to patchiness. Have any of you tried this range? 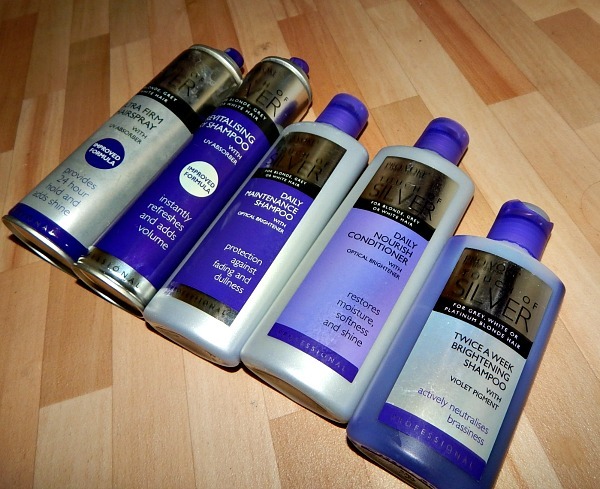 What are your favourite silver shampoos?